A common misconception exists about vanilla from Mexico, Central America and the Caribbean. People rave to me about the fabulous deal they got on a giant bottle of vanilla extract in Mexico, Haiti, Guadeloupe, etc. It has such a unique flavor and it’s stronger than any vanilla they’ve ever used. And wow, was it inexpensive! Well, sorry folks, it isn’t pure vanilla extract. In fact, the cheap, dark (or clear) product in the big bottle is not vanilla at all. It is imitation vanilla with unknown ingredients! Because vanilla originally came from Mexico, Central America, and the Caribbean, and because, at one time Mexico produced the world’s finest pure vanilla, it would seem plausible that it would still be true. In fact, more than 99% of all of the so-called vanilla extract bought in retail venues in Latin America is imitation vanilla. Mexico had the monopoly on vanilla production until the latter part of the 19th century and the vanilla-growing region on the Gulf of Mexico was very prosperous. In the latter 1800s, the French invested heavily in vanilla plantations in Reunion, the Comoro Islands, and later, Madagascar, and by the early 20th century these regions gained control of the world vanilla market. In the early 20th century, the Mexican Revolution raged throughout the country, and for a while, was especially fierce on the Gulf Coast of Mexico. Then the petroleum companies on the Gulf stripped the natural forests, making vanilla growing very difficult. 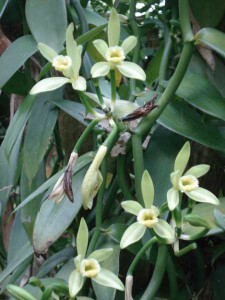 Mexico’s share of the world’s vanilla supply took a nosedive, but its reputation remained intact for several decades. In the 1880s the first synthetic vanillas came from Germany, providing a cheaper alternative to natural vanilla. Soon it was discovered that synthetic vanillin could be made from paper pulp and coal tar. Mexico, Central America, and the Caribbean began selling cheap synthetic vanillas hoping to cash in on Mexico’s vanilla connection. It worked. By adding coumarin to synthetic vanillin, the flavor was a little more like pure vanilla. Coumarin can be toxic, especially to the liver. We’ve outlawed its use in the United States since the 1950s. While most labels say, “No Coumarin,” don’t count on it! Although there are label laws in Mexico they aren’t enforced; in some of the other countries there are no restrictions. 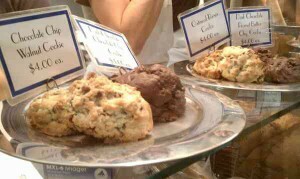 So, don’t believe that the label gives you an accurate account of the ingredients. Needless to say, synthetic vanillas are a big industry as most tourists have no idea they are being duped and it’s an easy product to sell. Mexico, Central America and the Caribbean are poor countries. Most Mexicans buy imitation vanilla too. If they can make a buck selling you cheap stuff that’s not what it says, they’re going to. Clear vanilla is pure, synthetic vanillin. It’s often called “crystal vanilla.” You can buy it in the US for about the same price. Dark and murky is synthetic vanillin, most likely ethyl vanillin derived from coal tar. It may also be dark because it contains red dye that we’ve banned in the U.S. or it may contain caramel coloring. Why does it smell so good? It has no alcohol in it (or possibly 2% as a stabilizer). It may have a concentration of vanillin, which makes it smell intensely like vanilla. 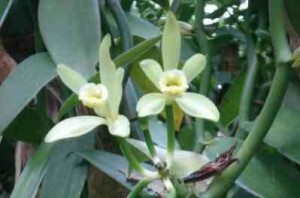 This is because both natural and imitation vanillin are an important part of the vanilla bouquet. Imitation vanillin is only one fragrance. Pure vanilla has over 500 organic components that make up its fragrance. There are some vanilla-vanillin blends and some cheap-quality vanillas that have 25% alcohol, but they aren’t worth buying either. How much did you pay for it? This is the biggest tip-off. If it’s in a big bottle and you paid $20.00 or less, it’s not vanilla extract. Pure vanilla extract usually costs more in Mexico than here. Don’t waste your money or endanger your health. If you want synthetic, buy it in the states. It’s the same price as you’d pay in Mexico but American synthetics aren’t adulterated with dangerous additives. If you want pure Mexican vanilla extract, buy it from us right here or from a another reputable dealer. 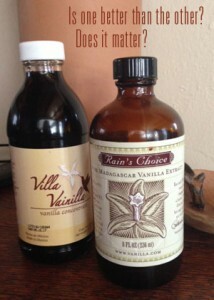 And this leads us to the next question – Which pure vanilla extract is the best? Amongst the pure vanilla extracts out there, which one is the best? Is there a way of knowing by reading the label? What should you look out for? 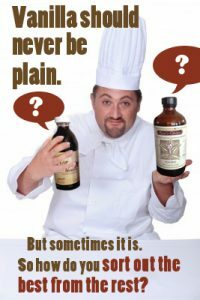 To answer those questions, please read my answer in “What’s the best vanilla extract?” You’ll learn how to tell the good from the bad, even amongst pure vanillas. I was given a bottle of clear Mexican vanilla purchased in Mexico. Usumacint . It says natural vanilla., the ingredients say pure vanilla. I have never used clear vanilla, but can see the value of it . Is it just as good as regular? I never buy imitation.